Handball Heroes is a fun, fast-paced interstitial series, with hosts Joel and Alannah on the hunt for the most skilled of handball manoeuvres to document in the 'Handball heroes Handbook'. Their quest takes us to visit twenty funny, quirky and spunky kids from Sydney, right up to the Torres Strait at the very top of Queensland and everywhere in between. In each episode, the hosts visit the Handball Hero in their hometown. We meet with their family and friends, see their hobbies and hear about their heroes in the ‘Hero Package’. After Alannah and Joel have worn themselves out chasing around after our energetic handballer, it’s time for their signature move… a move that combines each individual child’s unique influences, hobbies or aspects from their community. Handball Heroes is a visual feast - shot entirely on a high-speed camera and combining bespoke hand-drawn animation elements with 3D graphics, the signature move is the centrepiece for each episode. Each move is then ‘booked’ in the 'Handball heroes Handbook' for the rest of handball history! Handball Heroes is a fun, fast-paced interstitial series, with hosts Joel and Alannah on the hunt for the most skilled of handball manoeuvres to document in the 'Handball Heroes Handbook'. 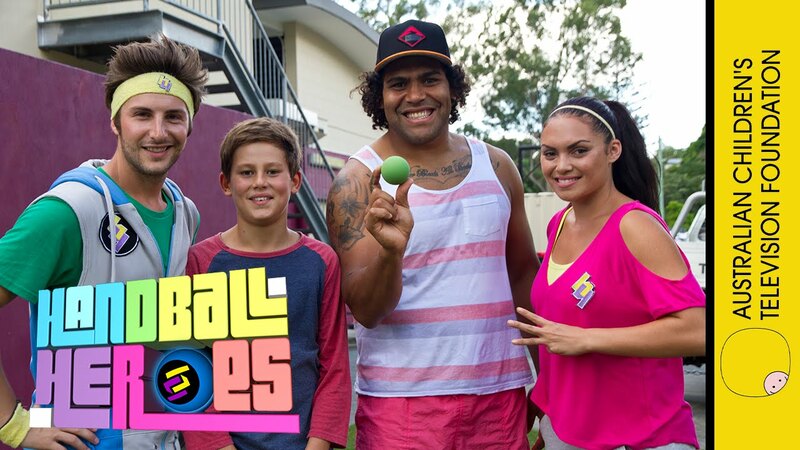 Their quest takes us to visit twenty funny, quirky and spunky kids from Sydney, right up to the Torres Strait at the very top of Queensland and everywhere in between.In each episode, the hosts visit the Handball Hero in their hometown. We meet with their family and friends, see their hobbies and hear about their heroes in the 'Hero Package'. After Alannah and Joel have worn themselves out chasing around after our energetic handballer, it's time for their signature move... a move that combines each individual child's unique influences, hobbies or aspects from their community. Fin, the creator of THE MISSILE, is a mad-keen Brisbane Broncos fan and when the Captain Sam Thaiday drops by Ashgrove, Fin can’t wait to show off his signature move! Madison from Bronte loves surfing and handball – combine the two and you’ve got her move, THE WIPEOUT! When surfing legend Bethany Hamilton drops in to find the best handball court in Bronte, our Heroes are totally amped! Our hosts are in Yarrabah, the largest Aboriginal community in Australia to find Vicky and THE YARRA BLAST. But that’s not the only drawcard – Vicky’s got more slick moves, like traditional dancing and… Creek Handball?! When Joel and Alannah hit New Farm, they won’t find any piglets waiting for them! Lily loves to skate-and-soccer up a storm around the old Brisbane power station, THE POWERHOUSE. Inspiration for Lily’s electrifying move! Legend has it that Kihi’s move, THE STRADDIE SLAM has been in his family for generations. But to get the move out of Inala and into the book, our heroes have to meet the mother of all Handball Heroes – Kihi’s Nan! This quad-bike loving girl from Weipa even has the crocs scared with her shot, THE DEATH ROLL. Moara lives for the outdoors and shows our hosts that even in the rain, you can’t dampen the effect of this monster move! Welcome to Island life. On Horn Island, you can catch your own fish, go island hopping and play handball on the beach. Hang on…handball on the beach? Kosta shows Alannah and Joel how to ISLAND HOP a little differently. Please welcome to the ring…. Elyjah! Our boxing champ from the Sunshine Coast comes from Samoan heritage. Just like the ancient volcanoes, Elyjah’s move THE SAMOAN SUPER SLAM will have its opponents trembling in fear! Not only is Claire a Handball Hero, she’s also a Brownie Hero! Alannah and Joel meet Claire in Cairns to bake brownies for the Wucchoperen Health Service before they get to see her killer signature move, THE STINGER. Malachi is one sporty Handball Hero and his REDFERN QUICKSTEP will have opponents ducking and weaving. Our hosts have to have fast feet to book this move, inspired by his Sydney football club, the Redfern All Blacks. Our heroes are in Townsville to seek out Jake and the famed TROPICAL PUNCH. But they’re not the only ones – Matt Bowen and Gavin Cooper from League team the North Queensland Cowboys are keen to check out this mighty move too! Enter Handball Hero Laianie; an island girl whose move is inspired by the legend of the Wongai tree. Once you taste the Wongai’s fruit – and the power of THE WONGAI WALLOP - you’re destined to return to the Torres Strait! Lights, Camera, Action! Hugo and Mateo are on the scene, camera in one hand, handball in the other, ready to shoot! Alannah and Joel stumble upon Hugo and Mateo in the cobblestone streets of Sydney to book THE DOUBLE SCOOP. Don’t adjust your TV screens; Tyler’s outfit is so bright it blinds opponents as he SAMURAI SLICES his way to victory. The Albany Creek boy’s move combines tennis and martial arts – and smacks Alannah and Joel off the court! Cairns is just a hop, skip and jump away from Gordonvale, where our hosts are to pounce on Teagan’s GORDONVALE HOP. Gordonvale is ground-zero for cane toads and these ugly dudes inspired Teagan’s move. You can’t stop THE HOP! Ryan’s living on the edge… The edge of Australia! He’s from Thursday Island – an island so small you can ride around it! And when he launches his move THE CANNONBALL from TI’s peak, the mainland had better be ready. BOOM! Our hosts pop up to the Sunshine Coast to meet Abbey – the adrenalin-loving dancing queen with a craving for Korean Pop, or K-Pop. Her move THE POP ‘N’ DROP is inspired by K-Pop, dancing and handball – a grooving combination! Olliebaz…. That’s a weird name… Don’t worry, it’s just what happens when you combine Oliver and Sebastian, a nickname worthy of the wacky Cairns brothers. Put down the sugarcane juice boys – it’s time for THE CAIRNS CUTTER! There are plenty of Crocs in Townsville. In fact, the Crocs inspired Tinarja’s signature move, THE CROC ‘N’ ROLL. A Croc even drops by for a game! Chris Cedar from the Townsville Crocs that is – her favourite basketball team! What do you get when you combine magic, hip-hop and handball? Add a kid with a serious amount of swagger and you get Zac and THE ZAC ATTACK! Watch in awe as this Morayfield maestro tricks his way into handball history!